The easiest way to share 3D data across multiple platforms. With eDrawings Professional you can create review-enabled eDrawings files that allow an unlimited number of recipients to mark up and provide feedback on product designs. With eDrawings Professional users can communicate and collaborate with clarity to maximize smooth product development. 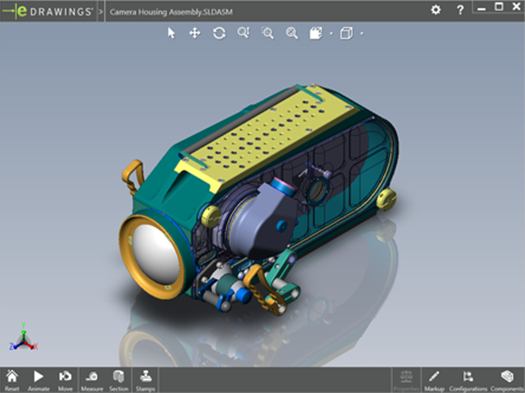 For eDrawings Professional Mobile users, Augmented Reality mode enables designers to share and show 3D designs and concepts that can be viewed in the context of the real world. All project stakeholders can understand the impact of real world constraints on designs and gain greater understanding of products and proposals. Building upon the strong foundation of eDrawings Viewer , eDrawings Professional enables true design collaboration with markup functionality allowing users to create, edit, and save reviews by redlining 2D or 3D data and adding comments. Users of eDrawings Professional can also measure geometry within an eDrawing files when dimensions are missing, but sensitive design data can be protected by simply disabling the measurement feature. eDrawings Professional is intended primarily for CAD users who need to both share product designs and coordinate design reviews and it is available for both Windows and Mobile platforms. eDrawings Professional contains a rich eDrawings API (Application Programming Interface) enabling users to customize the eDrawings Viewer, create interactive web pages, and translate files amongst other tasks.